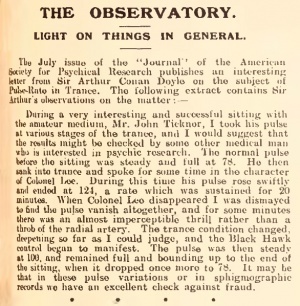 Pulse-Rate in Trance is a letter written by Arthur Conan Doyle first published in the Journal of the American Society for Psychical Research in july 1923, and reprinted in Light on 21 july 1923 in the Light on Things in General section. During a very interesting and successful sitting with the amateur medium, Mr. John Ticknor, I took his pulse at various stages of the trance, and I would suggest that the results might be checked by some other medical man who is interested in psychic research. The normal pulse before the sitting was steady and full at 78. He then sank into trance and spoke for some time in the character of Colonel Lee. During this time his pulse rose swiftly and ended at 124, a rate which was sustained for 20 minutes. When Colonel Lee disappeared I was dismayed to find the pulse vanish altogether, and for some minutes there was an almost imperceptible thrill rather than a throb of the radial artery. The trance condition changed, deepening so far as I could judge, and the Black Hawk control began to manifest. The pulse was then steady at 100, and remained full and bounding up to the end of the sitting, when it dropped once more to 78. It may be that in these pulse variations or in sphigmographic records we have an excellent check against fraud.